It’s taken a while, but the mittens and scarf to go with the Backroad Hats are finally ready. First, the Backroad Mittens. 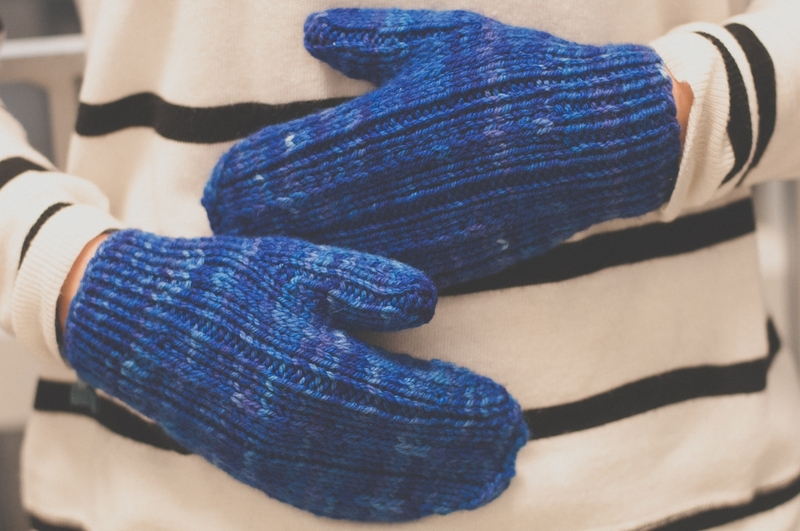 Worked in worsted weight yarn, the Backroad Mittens use the same stretchy, variegated-yarn-friendly stitch as the Backroad Hats and the Backroad Scarves. They’re worked from the cuff up, with a thumb gusset at the side, and end with a three-needle bind off. The pattern instructions are written rather than charted, though there is a chart for the thumb gusset for those who find that format easier to work with (like me). The sample is in Widdershin Woolworks Targhee Worsted—the same yarn as the variegated version of the Backroad Hats and the blue Backroad Scarf—a springy, soft, 100% Targhee yarn that’s raised, spun, and dyed in the USA. Targhee Worsted is available through Mooncat Fibers in Taos, NM (575-758-9341). Each batch is different; here are some of the colourways Michelle has done lately. I understand she’ll be dyeing up some new colours for spring in the near future. You will need approximately 130 yards/119m for the small (6.75″/17cm circumference) and 160 yards/146m for the large (8″/20cm circumference), plus 4.5mm/US7 needles, 4mm/US6 needles (or one size smaller than the needle that gets you gauge), three stitch markers, scrap yarn for holding the thumb stitches, and a yarn needle to weave in the ends. I was so pleased with how this simple, soothing stitch pattern works with different yarns and dyeing techniques that I did a bunch of scarves, too. 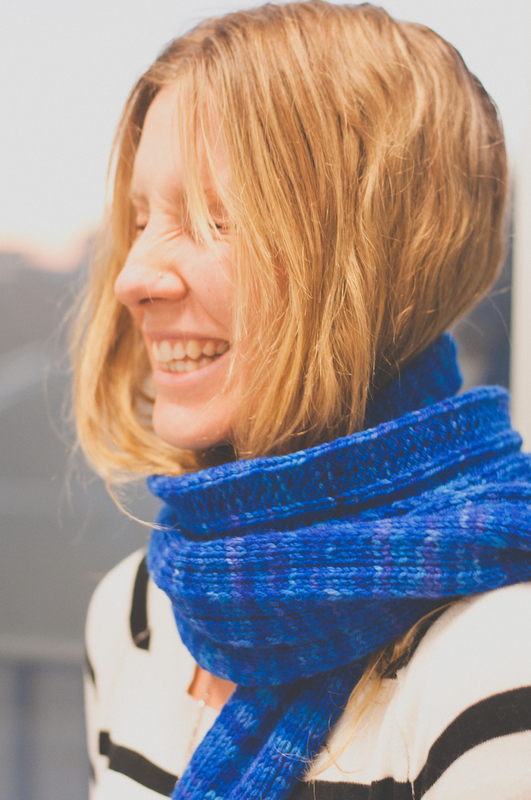 The Backroad Scarves pattern includes instructions for worsted, Aran, and bulky weight yarn, and for a long scarf (90″/229cm), a medium-length scarf (68″/173cm), and a short, buttoned cowl (50″/127cm). Each yarn is made in the US from sheep to skein, showcasing just a bit of the variety of local yarns that are now available. 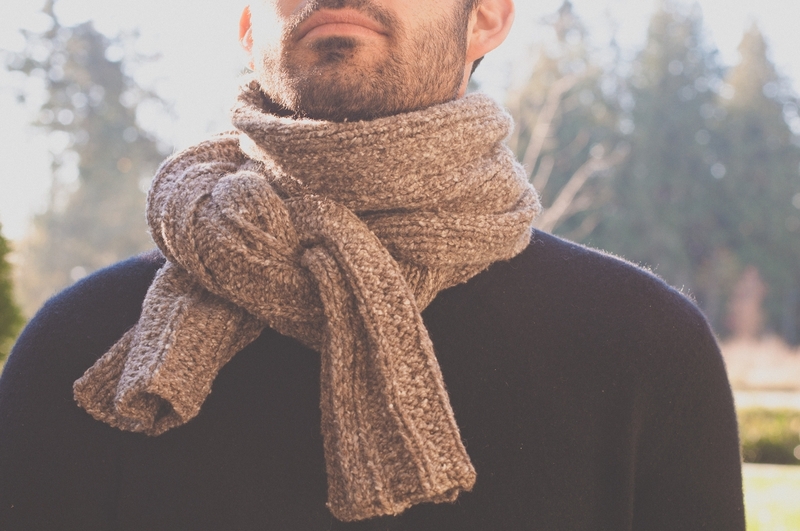 As mentioned above, the worsted weight scarf uses Widdershin Woolworks Targhee Worsted. Michelle dyed this blue/purple up especially for the samples; I love its cheerful brightness and subtle variegation. The worsted weight scarf calls for 438 yds (600 yds, 789 yds)/401m (549m, 722m) yarn, plus four 1″/2.5cm buttons for the cowl. I went in a completely different direction with the Aran weight scarf, using Marr Haven Organic Mule Spun Worsted. This woolen-spun Merino/Rambouillet yarn yields a soft, spongy fabric with lots of air and very little stitch definition. Combined with this stitch pattern, it makes for a textured, extra-squishable scarf with a lot of warmth for its weight. The Aran weight scarf calls for 349 yds (431 yds, 627 yds)/319m (394m, 573m), plus three 1.25″/3cm buttons for the cowl. Alas, Marr Haven sold off their flock after I finished the sample, so there’s not much yarn left in their shop. However, there are lots of farm yarns out there that would give a similar effect: look for a soft, woolen- or mule-spun yarn with a bit of a rustic texture.